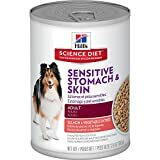 Looking For The Best Canned Dog Food For Sensitive Stomachs? Here’s a look at our favorites, including our top pick – Hill’s Science Diet Sensitive Stomach & Skin Dog Food. 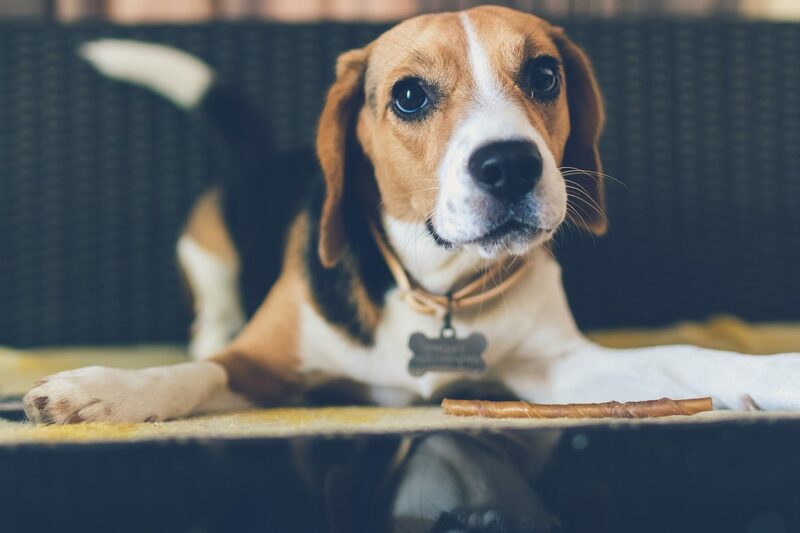 Dogs are just as susceptible to food allergies, ingredient intolerance, and digestive issues as people, so it’s important to pay special attention to what you’re feeding them. Feeding the wrong food to a dog with a sensitive stomach can lead to a significant loss of appetite, and that can cause problems like unhealthy weight loss, muscle deterioration, vomiting, and diarrhea. High-quality protein – unless you’re trying a vegetarian diet, high-quality animal-proteins should be the first ingredient on the label. Dogs with sensitive stomachs tend to have issues with beef, so you’ll see that most dog foods designed for sensitive systems use chicken, turkey, lamb, or salmon. If you try a new food and your dog is still showing symptoms of an upset stomach, try to switch to a food with a different protein base. Fillers – dogs with sensitive stomachs will almost certainly have issues with fillers like meat by-products, wheat, and corn. A good quality canned dog food shouldn’t include any fillers. 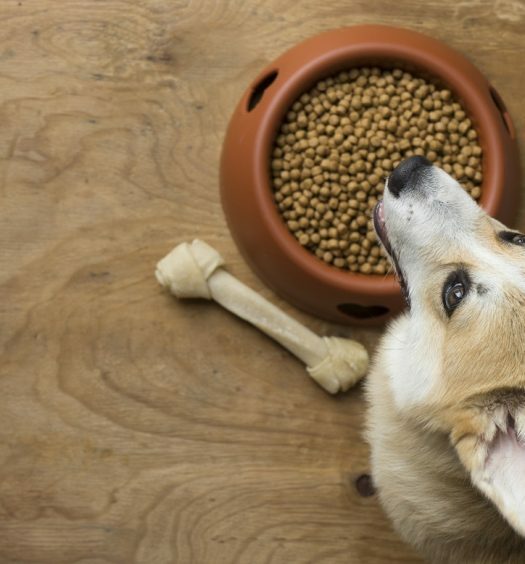 Targeted nutrition – good food offers all of the vitamins and minerals your dog needs to be healthy, but great food offers nutrition that is targeted to their size, life stage, activity level, and special needs. 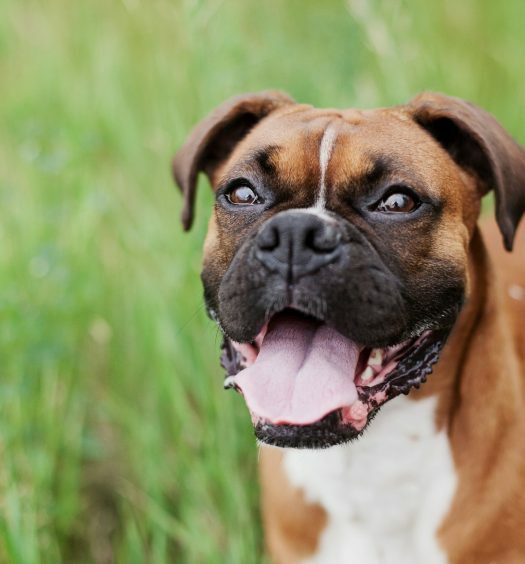 Fiber – if your dog has diarrhea or loose stools, it may be due to a fiber deficiency. Try using a food with a higher fiber content that’s easier to digest. Fats – avoid dog foods that list oils or fats in the first four ingredients . I have to admit that I’m a little biased towards Hill’s Science Diet food products. It’s the brand I trust to feed my dog, and it’s the brand that most veterinarians feed their own dogs (according to the most recent survey in 2016). Vets know what to look for in a healthy dog, so it speaks for itself that they use Science Diet dog food. So, what makes their food so special? Hill employs over 220 veterinarians, nutritionists, and scientists to ensure that everything they produce provides targeted nutrition. They use high-quality proteins, with salmon, lamb, or chicken as the first ingredient. Then they add the perfect blend of vitamins, minerals, and amino acids to provide completely balanced nutrition. They never use any artificial preservatives, flavors, or colors, and there aren’t any fillers, by-products, wheat, or corn. Purina Pro Plan is another great product that offers tailored nutrition. Purina’s advanced nutrition comes from over 85 years of research and experience, and is backed by over 400 behaviorists, veterinarians, nutritionists, and food scientists. For its Pro Plan lineup of dog food, Purina carefully selects the perfect mixtures of high quality ingredients and specialized nutrition to meet specific needs such as sensitive stomachs, sensitive skin, different life stages, breed sizes, and weight management. Real meat is always the first ingredient, and every other ingredient on the label is chosen for a specific purpose. 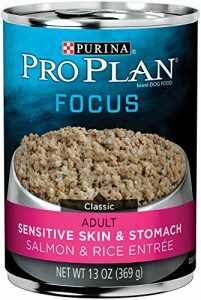 This particular wet food blend uses salmon as the primary source of protein, a meat that is nutrient-rich and easier on sensitive stomachs. It’s formulated for easy digestion, offers 100% complete and balanced nutrition, and includes linoleic acid (an Omega-6 fatty acid) to support a healthy coat and skin. One of the best ways to cater to the needs of a dog with a sensitive stomach is to provide food with limited ingredients, as fewer ingredients limits allergies and ingredient intolerances. 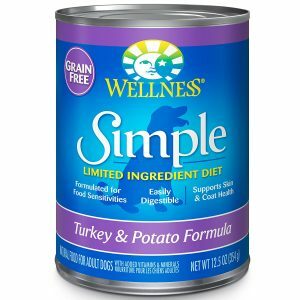 Wellness Simple Limited Ingredient Diet wet food keeps it simple with a single source of protein (turkey) and easily digestible carbohydrates. There aren’t any fillers or additives, so you won’t see wheat, corn, soy, gluten, or artificial flavors, colors, and preservatives. Even with a limited list of ingredients, the food provides complete and balanced nutrition. All Wellness products are made in the USA, and the company guarantees your satisfaction or your money back. 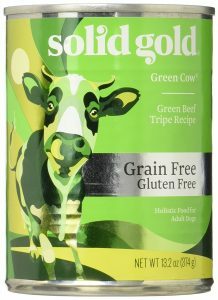 Solid Gold was America’s first holistic pet food company, and its recipes are 40 years in the making. The company’s founder has led a community of animal lovers, experts, nutritionists, and explorers to create holistic nutrition that positively changes pets’ lives in mind, body, and spirit. The company’s Green Cow Green Beef Tripe Recipe is highly palatable and easily digestible, so it’s ideal for picky eaters and sensitive stomachs. It’s packed with nutrient-rich protein, and it’s a fantastic source of healthy fats, vitamins, and minerals. The mix also has naturally lower phosphorus levels, and it’s carrageenan-free, grain-free, and gluten-free. You can serve this wet food on its own for a complete and balanced meal, or you can use it as a tasty topper on dry food. 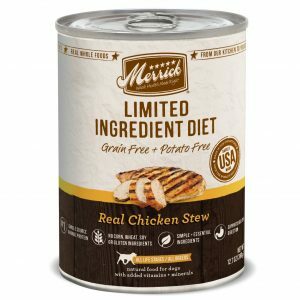 Merrick Grain Free Limited Ingredient Diet Wet Food is another great option for dogs with sensitive stomachs, food allergies, or ingredient sensitivities. This line of dog food keeps it simple with a single source of animal protein, so the first ingredient is always deboned poultry, fish, beef, or lamb. The carbohydrates are easily digestible, and you’ll never see any grains, corn, gluten, potatoes, or fillers. When I’m looking to purchase pet food, my goal is to strike a balance between quality and value. I’m sure that $50 pack of wet dog food with real filet mignon is great, but if I can’t afford to eat filet mignon every night, I don’t think my dog can, either. At the opposite end of the spectrum, I don’t want to get the cheapest food on the shelf because my dog’s health and longevity is worth the added cost of good, wholesome food. To me, the Hill’s Science Diet and Purina Pro Plan canned dog foods strike that balance. They both offer complete, balanced nutrition, with targeted ingredients for dogs with sensitive stomachs. I mentioned that I feed my dog Hill’s Science Diet food so that’s obviously my first choice, but the Purina Pro Plan is a close 2nd. If your dog has an extremely sensitive stomach and requires a limited ingredient diet, go with the Wellness Simple Limited Ingredient Diet. Their food is highly reviewed, and the limited ingredients are beneficial if you’re trying to isolate which foods your dog is sensitive or allergic to.